Hey Dunkin Donuts, grow a pair. Look, I can’t stand Rachel Ray just as much as the next person, but if we’re gonna hate on her, let’s do it for the right reasons. The fact that Dunkin Donuts took down this picture of her because some mental patient claimed she was wearing a scarf similar to that worn by Yassir Arafat is a disgrace. 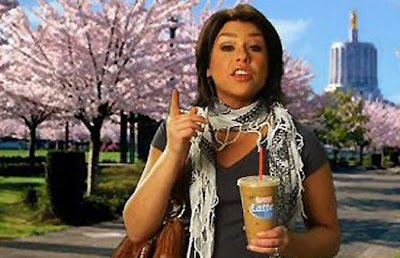 That being said, Dunkin Donuts should be boycotted until it removes the annoying Rachel Ray from its advertising campaign! Those who are reading- join the struggle- the…I’m looking for a word that means struggle- that inspires a battle- I can’t think of it- but anyway, you get the point! Lose Rachel Ray! AUTHOR'S NOTE: Sorry if some of this stuff happened last week- been a little busy lately showing off my newly cleaned prives. Agreed - she's the most annoying person on the planet.